This man I started talking to on MeetMe. 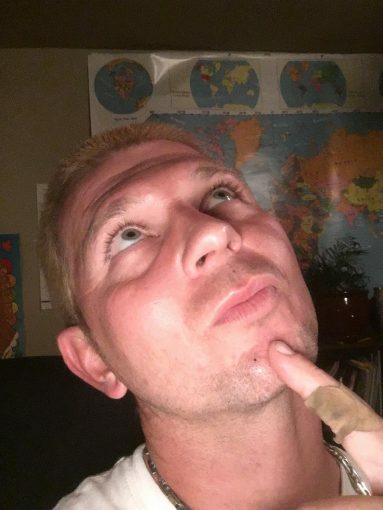 He’s 36 years old, he goes by Chad, and so far that I have seen his MeetMe profile changed to 3 different locations: Sapulpa, Kellyville, and Mounds. He says he’s a contractor and does multiple remodeling businesses. He has three kids and he’s divorced. Allegedly. I talked to him in July, we made a good connection and multiple times we were supposed to meet and he never went through. I was clear with him on what I wanted which is something serious and he still continued to talk to me telling me he was hoping for something serious as well. Well, July progressed all the way to October and it’s almost November. He would ignore me for weeks on end and come up with excuses. Then he would check in with me for a few weeks. I told him if he did not have time on his hands, I could go out of my way to see him myself and he would ignore the subject. Finally I got impatient and I asked him what was going on when he confessed that he met a woman at his job and tried to be in a relationship with her instead even though be barely knew her and he had been talking to me for months. I tried to forgive him but the principle of the matter is, he lied and withheld truth and strung me along until he could figure out what he wanted to do. His excuses were even lies and gaslighting so he could shift any accountability on his end. And if he really wanted to see me, he would have seen me by now. There has to be a reason why this man behaved the way he did: either a) he’s not sure of what he wants b) he’s with someone and living a double life of secret affairs and he just didn’t know where to squeeze me in. C) he’s a catfish just getting his rocks off. If anyone knows this man please leave a comment because I would like some closure knowing that I did the right thing ditching him.